After having killed her Alt and living to completion (which just means being able to eat food that is more meat than non meat), Grayer is suffering from PTSD (a la Catching Fire) but only when its convenient and is busy training Idles to learn how to survive long enough to become Completes (see also The Hunger Games). She is also trying to readjust to her new life post kill by attending school, learning math, how to portion allotted food and water and how to be a well adjusted, not murderous member of society. As with other Completes, she must also man the barriers of Kersh once a year for five years on a tour of duty. You would think there would be no plot here, and there isn’t, so Elsie Chapman invents one where West is hired by a Level 1 Operator to kill the Alts of other Level 1 Operator’s kids. In exchange, West is promised that her children will never have to face their own Alts and the trackers that mark West as an illegal Striker (read: hired assassin) will be removed. Because there’s no one else more capable of completing this extremely difficult job except this one teenager? If this book is about anything (which is a serious stretch), it’s about further fleshing out West’s world: the world of Kersh, which we learn was created by the Founders: Cris, Jackson and Tamryn. Dissatisfied with the never-ending wars in the United States, the Founders claimed land in the Pacific Northwest (presumably by putting a flag in it) and erected an electrified barrier around the land now known as Kersh. The Founders created Alts when they began running out of space and resources, in order to ensure that they had the strongest citizens possible to protect them from the Surround. So obviously creating two sets of the same person to deal with this problem and force them to fight to the death is the best possible solution. Also, because everyone in Kersh is sterile and needs the government to help them procreate thanks to some pesky complications with a universal cold vaccine. Unfortunately, Chapman waits until the end of the novel to remind readers of this plot point. So too bad if you merely forgot about it. The Board, AKA the Post-Completion Department also plays heavily in the novel, specifically the overly devious Operator Sabian who hires West, a former Striker who illegally killed others Alts in order to train for her own assignment one day. Specifically because she was too poor to be able to train otherwise. I’ll get to that problem later. Operators are broken into three divisions, Level 1 which focuses on political matters, Level 2 which is military and Level 3, formerly of the science division. Operators children are born into their parents positions and the only way to move up in rank is if a Level 1 becomes Incomplete, prompting a Level 2 recruit to take their place. This will eventually be important because reasons. The structure of the Board represents the class differences that Kersh suffers with throughout the novel. In order to ensure their survival, the rich are able to hire Strikers (even though Assist Kills are illegal) and the Operators are able to erase illegal hires so that their own children don’t have to fight — completely undermining the system that Kersh is built upon. Even more confusing, the Alts of Peripheral Kills (Idles killed by other Alts incidentally) or Idles who die a natural or accidental death are viewed by Operator Sabian as not worthy of being citizens. Which seems to go against the idea that artificial selection is used in order to give Kersh the strongest citizens possible. According to him, Completes created by artificial selection are good and natural selection are bad. Why even nitpick? A richer Alt is not necessarily the stronger one, but since they have better advantages and more resources than their poorer Alt they are more likely to survive. And somehow in Kersh this is more acceptable than the strong surviving because they’re stronger to further ensure the survival of society. Not that Chapman dwells on this at all. Painfully, Chapman also refuses to address the implications of creating a society solely of killers. What does it mean when your entire world is made up of murderers? Besides the fact that it creates a corrupt government not beyond breaking its own rules to get what it wants for itself. Even if it means putting their own needs above those of Kersh: a place that needs citizens to be the strongest them they can be in case of war from the Surround. Not that we are clued into what this threat is or if there even is any. On the plus side, the novel gives us a brief glimpse at the true origins of Kersh (that one time), which while intriguing are ultimately glossed over for reasons unbeknownst to me. Probably because the tale of West Grayer and her super hot boyfriend Chord were considered far more important. I can’t help but disagree. The YA tome also introduces an intriguing new plot device: the Roark gun, a dangerous prototype still in the planning phases which uses poison to kill a target quickly and painlessly if hit in a pulse point. If you miss, the intended is melted from the inside out. Slowly. Thankfully for West and the plot, she learns that hitting someone in the eye with this device will erase their Alt code, turning them into an Incomplete while still allowing them to live. Just without an identity. Also forcing them to escape into the horrifying Surround. Again, not that it’s necessarily dangerous. This idea of an in-between human (neither a Complete or an Incomplete) is an intriguing premise, which is probably why Chapman chooses to ignore the implications of dealing with “non-humans” and never brought them up ever again. I was sort of hoping that these two issues (as well as the others I’ve harped on) would be discussed in a third book, but Chapman has revealed that the series will end with Divided since this is apparently a “duology.” Ugh. Is that a pun? That’s a pun, isn’t it? You know what would have been better? 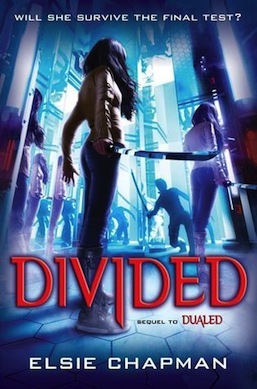 A version of Dualed told from the perspective of West’s Alt so we can more fully explore the class differences and broader themes of this series. But again, that would be ridiculous. Seriously, can I get a reboot?